Ask Ted Wright, MD, what would cause him leave a major academic medical center and move to West Tennessee and he will tell you, "Yuck and yum." Then he will elaborate on what prompted the move from Lexington, Kentucky, to Jackson, Tennessee. "Life is a series of yum and yucks," said Dr. Wright. "And you have to find a balance of the two. 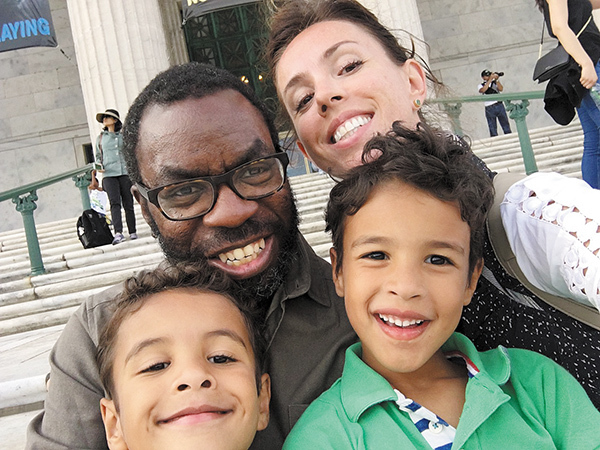 As a husband and an older father of twin five-year-old boys, as well as a busy cardiothoracic surgeon, I knew I needed to find that balance. The opportunity in Jackson gives me that and so much more. "Living in a community that is friendly and family-oriented is a way to balance the yum and the yucks. What I have found in Jackson is nice folks who are raising their families here and a great tradition of heart surgery. I was also impressed by the number of physicians who came here out of training thinking that maybe this was just a springboard and yet they are still here and so glad to be here." While he may be finding the right balance between work and family in Jackson, he isn't the only one benefitting from the move. As the newest cardiovascular surgeon to join West Tennessee Healthcare's Heart and Vascular program, patients are benefiting from the additional treatments he brings with him that will expand the services offered in Jackson. Wright hails from Ashbury Park, New Jersey, which is on the Jersey Shore. His mother says he declared he would be a doctor - and a surgeon no less - as a youngster after a day on the playground. He attended Princeton, which was nearby, and took pre-med classes then attended the University of Virginia Medical School. While in med school, Wright was inspired by several physicians who not only impacted him personally but also influenced the path he would choose to follow. "I was inspired by these physicians who were skillful, thoughtful and respected," Dr. Wright said. "That was something I wanted to emulate. They were educators and trainers of residents and patients. They were people who were looked up to. They were role models and people I identified with in school." Dr. R. Scott Jones, a surgeon at UVA, encouraged him to pursue surgery. "There is an immediacy to it," said Dr. Wright. "There is a defined problem that you can fix, and lives are improved immediately. That was important to me." Dr. Wright's general surgery residency was completed in his hometown at the hospital where his parents first met: Monmouth Medical Center. Another physician, Dr. Charles Sills, a thoracic surgeon, inspired Wright to pursue cardiothoracic surgery. "I loved the anatomy of cardiothoracic surgery, there is a complex simplicity to it," Dr. Wright said. "You can't get around it. You can't stop in the middle - you have to follow it to the end. There is a sports aspect to it, the pre-game, the game and the post-game. You can reflect on what you have done which I think is good." After his residency, Wright went to the University of Wisconsin for a fellowship in cardiothoracic surgery followed by a cardiopulmonary transplant fellowship at the University of California in San Francisco. He was then recruited by a cardiovascular surgery practice in Lexington, Kentucky, and headed to the Bluegrass state. When the practice became a part of the University of Kentucky Medical Center, Wright had the opportunity to be a part of the residency training program in addition to his practice. One aspect of the training program was the mortality conference which looks at poor outcomes, which drove home the fact that in the medical environment there is so much pressure that you have to have other aspects in your life that are good. One of the residents he had trained, Dr. Hetal Patel, had joined a cardiothoracic practice in Jackson and suggested Wright take a look at the practice. Of course, that's where he found the yuk and yum. Although Wright just joined the practice in early January, he already delivered a wealth of knowledge and experience to the practice. "We had a great multi-disciplinary meeting with cardiology," he said. "And have identified some areas where we feel we can expand services, especially surgical treatment of atrial fibrillation and minimally invasive services. We will be able to provide cutting-edge services that will mean patients won't have to travel out of town to get them. We are well poised to serve this community very well and I am looking forward to doing it."